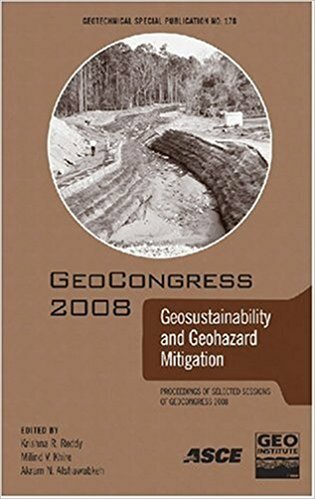 Akram N. Alshawabkeh, Krishna R. Reddy, & Milind V. Khire (Editors), "GeoCongress 2008: Geosustainability and Geohazard Mitigation: Engineering Methods"
Geosustainability and Geohazard Mitigation contains over 140 papers that were presented at the 2008 GeoCongress, held in New Orleans, Louisiana from March 9-12, 2008. This Geotechnical Special Publication discusses the challenges of sustainability in geotechnics. It covers topics on education, sustainable materials and infrastructure, risk-based analysis and design, and impacts and mitigation of geohazards.